The kyat (pronounced ‘chat’) is the official currency of Myanmar, abbreviated as ‘K‘ or 'MMK' and usually placed before the numerical value (i.e. K500). Kyat come in notes (no coins) of value K50, K100, K200, K500, K1000, K5000 and K10,000. The US dollar, however, is used as an alternative currency, particularly for larger purchases: foreigners are sometimes expected to pay in dollars for hotels, high-end restaurants and flights (international credit cards can also be used for many of these purchases – for more information go to the bottom of this page). If payment is made in kyat for these transactions, it may sometimes be at a worse rate; when paying in dollars, change will often be given in kyat. Smaller purchases, such as taxi rides, buses and cheaper to mid-range meals are quoted and are almost always paid for in kyat. As local currency is readily available at ATMs, how many USD you choose to take with you will depend on the type of trip you are planning and what your own USD reserves are – typically, it is not necessary to take more than a few hundred dollars as back up. If you are spending more than a few days outside of Yangon, Mandalay or Nay Pyi Taw, make sure to exchange enough money beforehand or make the necessary ATM withdrawal; it can be difficult to change money outside the main cities, and you will probably get a worse rate. ATMs are also more difficult to find in these areas (see more information below on ATMs). Important note! US dollar bills taken to Myanmar must be in PERFECT CONDITION. Dollar bills should be brought to Myanmar in differing denominations: take plenty of $10, $5 and $1 bills to pay for hotels, flights and historical sites, and take $100 or $50 bills for exchanging to kyat (larger denominations usually get a better rate). Blemishes of any kind – creases, marks, folds and so on – may result in getting a far worse rate of exchange or the money may not be accepted at all. Also, pre-2006 dollar bills or ones with the letters AB and CB at the start of the serial number (at the top left corner of note) may not be accepted. Euros are generally accepted as an exchange currency and do not have to be in pristine condition. It is therefore advisable to carry US dollars in a safe, flat folder – not in a wallet. 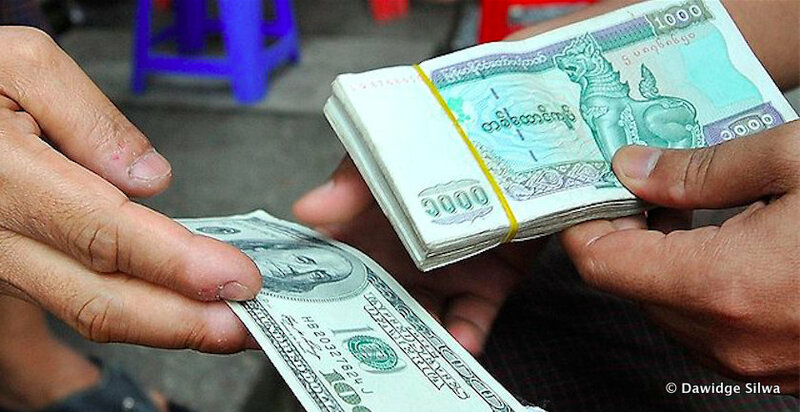 Money can be changed at banks in the downtown areas of larger cities and at most major airports, including Yangon, Mandalay, Nay Pyi Taw, Bagan and Thandwe (for Ngapali beach). In Yangon, you can also head to the popular and central Bogyoke Aung San Market (Scott Market) if you want to change money at the weekend – here you can find numerous money-changing shops (these tend to shut around 3.30 to 4pm). Until recent government reforms, it was necessary for visitors to Myanmar to change money on the black market in order to get a reasonable exchange rate. This is no longer the case; you can now get a good exchange rate at banks and official money exchanges. Money changers on the street should be avoided, as they are likely to scam you. Unsurprisingly, the exchange rate is subject to fluctuation; check online for the latest rates before exchanging. While visitors once had to bring in all the necessary cash for their travels into Myanmar, there are now thousands of ATMS that accept international bank and credit cards located around the country – although bear in mind that most are concentrated in Yangon, Mandalay, Nay Pyi Taw, Bagan and Inle Lake. Cardholders can also withdraw local currency from ATMs and use their cards at a growing number of major outlets such as hotels, restaurants, and retailers. Currently only Visa, Mastercard (Maestro/Cirrus), China’s Union Pay and Japan’s JCB can be used; the biggest providers of compatible ATMs are CB (Co-operative) Bank and KBZ (Kanbawza) Bank. Others include AGD Bank, AYA Bank and United Amara Bank. For ATM cash withdrawals, there is typically a K5000 transaction fee, and a withdrawal limit of K300,000 per transaction. Depending on the conditions set by your own bank at home, you may be allowed multiple withdrawals per day. The use of ATMs in Myanmar is sometimes restricted by internet failure. There are no international banks in Myanmar at the moment, and local banks are in the process of becoming part of the international banking system. KBZ Bank and CB Bank are the largest local banks and have country-wide network of ATMs that accept Visa, Mastercard, Union Pay and JCB. Yangon locations include Yangon airport, all major shopping centres and markets, as well as many smaller branches dotted around town. Outside of Yangon, they have branches and ATMs in all major cities, airports and tourist spots. The use of international bank and credit cards to pay for goods and services at outlets in Myanmar is currently limited but, as with so much in the country, the situation is changing fast; in Yangon and some of the more popular spots around the country, cards can be used at point of sale – although a significant transaction charge may be incurred. Traveller’s cheques are not generally accepted in Myanmar.